Our worship pastor at church is currently on vacation in Hawaii. How nice to be him. He’s posting gorgeous pictures of sandy beaches and brilliant blue skies. I spent my time today huddled in my freezing garage waiting for the few brave souls who could bear the wet dreary 55° day to come check out my stuff for sale. Why is it that every time my neighborhood garage sale happens, it’s remarkably crummy weather? Oh that’s right. I live in Seattle. And it’s May. As I was preparing for my morning tomorrow at church I decided this batch of island vacation cupcakes would be a perfect way to ease the jealousy of the rest of the church volunteers. I’m sure I’m not the only one who is wishes I could be somewhere tropical, sipping a frosty beverage and listening to the lulling sounds of waves crashing on a pristine beach. And I don’t even really like sand. But I need a vacation. I’d be willing to deal with a beach to get one. 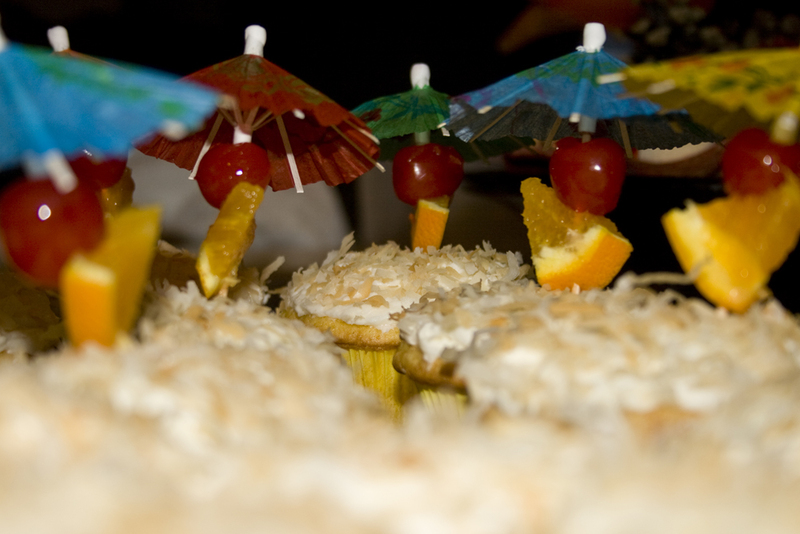 These delightful little morsels have all the flavors of a perfect beachy drink. Coconut, pineapple and rum. Or in this case, rum extract. 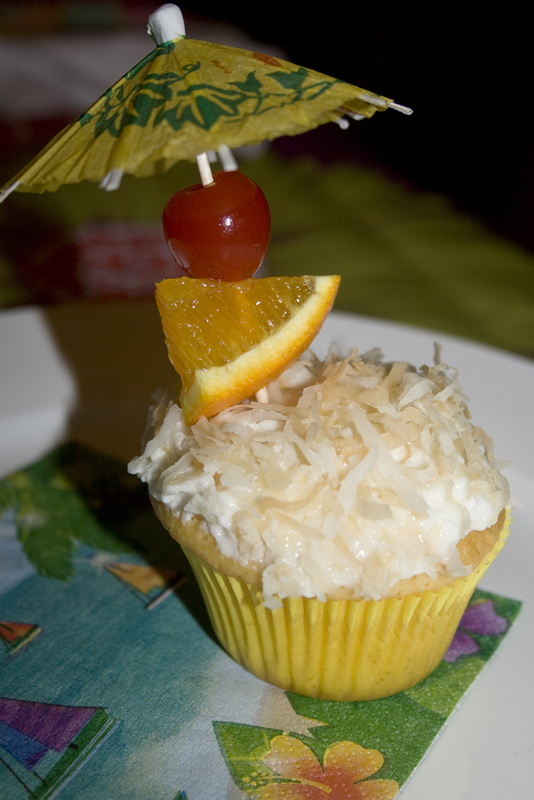 I almost feel like it is summer right now because my whole kitchen is filled with the smells of a tropical island. If there wasn’t rain pelting my windows, I’d swear I was on vacation, just returned from a swim. 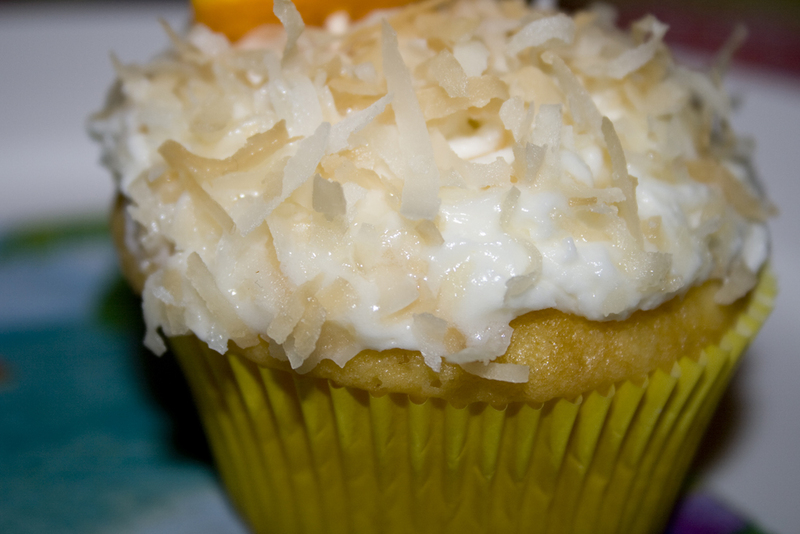 Seriously – the smell of these cupcakes is just like coconut tanning lotion and a pina colada. Which is what all vacations should smell like. This recipe uses a cake mix, which I stuck with tonight because practically freezing to death all day and being bored out of my mind kind of took the “baking from scratch” out of me. If you aren’t a fan of boxed stuff – I put a substitution for the box at the bottom of the recipe. Just look how awesome they are. Doesn’t it look like a bunch of tourists hanging under umbrellas on the beach? 1. Heat oven to 375°F (350°F for dark or nonstick pan). Place paper baking cup in each of 24 regular-size muffin cups. In large bowl, beat cake mix, oil, water, 1 teaspoon rum extract and eggs with electric mixer on low speed 30 seconds. Beat on medium speed 2 minutes, scraping bowl occasionally. Stir in the pineapple by hand until incorporated. Divide batter evenly among muffin cups. 2. Bake 14 to 19 minutes or until toothpick inserted in center comes out clean. Cool 10 minutes; remove from pan to cooling rack. Cool completely, about 30 minutes. 1. Toast Coconut: Spread on baking sheet and bake at 300° for about 20 minutes, stirring every 5 minutes to make sure that the coconut browns evenly. Set aside to cool while cupcakes are cooling and you are making the frosting. 2. In a standing mixer fitted with the whisk attachment, beat the butter at medium-high speed until smooth, about 20 seconds. 3. Add confectioners’ sugar and salt; beat at medium-low speed until most of the sugar is moistened, about 1 minute. Scrape down the bowl and beat at medium speed until mixture is fully incorporated, about 30 seconds; scrape bowl, add coconut extract, rum extract and heavy cream, and beat at medium speed until incorporated, about 20 seconds, then increase speed to medium-high and beat until light and fluffy, about 4 minutes, scraping down bowl once or twice. 4. Spread frosting on cupcakes. Dip tops of frosted cupcakes in coconut. For a super islandy feel, garnish with a maraschino cherry and orange wedge stuck thru a paper umbrella. Store loosely covered at room temperature.